Ruth Anne Gray, historian and preservationist of the African Methodist Episcopal Zion Church on Ramona Street in Palo Alto, looks out at the restored glass windows of the church in April. Photo by Veronica Weber/Palo Alto Weekly. Clarence Nicholas, 90, stood outside a small, stucco building in downtown Palo Alto last Saturday afternoon, his hands clutching a piece of paper on which he'd written the lyrics to "Because He Lives." It was his late wife's favorite hymn. They married in the stucco church on Ramona Street in 1957, he said. "It was very sunny and very warm, just identical like it is today," he said, his voice gravelly but melodious. "We were so happy. ... We had a wonderful afternoon here." For Nicholas and about three dozen other members of the oldest black congregation in Palo Alto, University A.M.E. Zion Church, Saturday was a homecoming of sorts. Their original church at 819 Ramona, built in 1925, had faced near-certain demolition for decades. But aided by the City of Palo Alto and real-estate developer Menlo Equities, the dilapidated building was recently restored as part of a larger office-and-housing project on the corner of Ramona and Homer Avenue. The church itself will become office space. Members of the congregation got their first peek inside the historic building on Saturday. Many had never seen the old church -- the congregation had moved in 1965 to a new facility on Middlefield Road and sold its original home to the Palo Alto Medical Foundation. But a handful of old-time members returned. 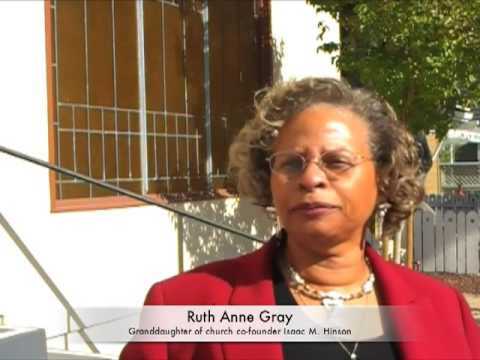 Among them was Ruth Anne Gray, the granddaughter of co-founder Isaac M. Hinson. In the late 1980s, she led the fight to save the church from demolition after it had fallen into disrepair and the medical center planned to use the land for expansion. She applied to the National Register of Historic Place in 1996 to secure the church's historical significance on the register. Among its notable features, she wrote, was the story of how the young, black church had benefited from the help of the wider Palo Alto community during the 1930s. Despite ongoing racial segregation nationally, the church received donations from whites and Asians alike who rallied to keep the building from foreclosure. In 1935, half of the church's $3,500 debt was covered; by 1939, the mortgage was paid off, according to news articles at the time. On Saturday, a bell tower and triangular stained-glass window, pointing heavenward, rose above Gray. "It was in pretty bad shape until Menlo Equities started working on it in 2007," she said. "I'm absolutely delighted it has been restored. ... This is the result after so many years." She said she'd oohed and ahhed over the hardwood floor, which had been restored to the state she'd remembered, along with the stained-glass windows, freshly painted stucco walls and wood trim. Only the addition of a bathroom and wheelchair lift and the closing of a tiny mezzanine were new. The rehabilitation had its challenges, according to staff with Menlo Equities of Palo Alto and construction firm Webcor Builders, whose work on the mixed-use project also included the restoration of the historic French Laundry building on Homer. The church had to be jacked up onto stilts while a basement and underground garage were constructed. Then the church had to be rebuilt to add structural integrity. Broken window panes were replaced with new glass made to match the original panes, according to a Menlo Equities spokeswoman. Those difficulties fell to the wayside Saturday as congregation members held an hour-and-a-half-long worship service in the restored church. Members of the city's Historic Resources Board and city Historic-Preservation Planner Dennis Backlund attended the event. The simple building deserved the efforts made to save it, Backlund said. Its history represented the core values of the city: freedom, equality and the unity of all people into a single community. "The restoration of this building is kind of a mirror image of a communal effort by which it was built and by which it was maintained during difficult times," he said. "We did our part to make sure the historical outcome really represented its history. We feel, looking at it, that it really does, and so meticulously, too." Doris Richmond, a slight woman whose late husband also fought to save the church, said she was grateful to see the old building reflecting its former glory. She recalled the years when she would stop by on Saturdays to bank the pot-bellied stove, so the building would be warm enough for Sunday school the next morning. She said she's been touched by the building's transformation and the good memories it's brought back. "Sometimes," she said, "I just sit on the steps and cry." Congratulations Ruth Anne and all of you who made this happen. I had discussions with Ruth Anne back in the 1980's about this historic landmark. I remember touring the building with an eye to see if it couldn't be turned into some community center or even a folk music club. The obstacles to getting this building restored seemed Herculean and you have accomplished what I never dreamed would be accomplished. Well done! I only wish I had known about this event so I could have attended to congratulate you all on your efforts in person! PS I am wondering if you at least got photo documentation of the basement Sunday School room with the fairy tale drawings on the wall. If it is a garage now, those are probably history. They were sooooo charming and harkened back to a different time. A wonderful and inspiring story. Kudo's to all the people who worked so hard and long to make it happen. Posted by Let it be, let it be..
"Flower Child, 1966"..I tried to rent this church from the Palo Alto Medical Foundation so I could live in it when I first saw it was empty. (I had gotten the idea from the movie "Alices Resturant"and at the time it seemed something I would have like to have done.) Sadly, I was turned down as I was told the Foundation had plans to demolish the building. I am pleased to pass on the legacy to the future generations who will inherit this place called Palo Alto. Yes! What a hard task done with the save and restoration of this church. I'm 3rd generation Palo Alto resident. My grandchildren are proud to see history of black families exsisted in Palo Alto some many years ago. Walking down town is forever a special event. Amazing: Isaac MacDuffy(Mac)Hinson and the person my brothers, sisters and several cousins called Grandpa, while growing up in Palo Alto, are one in the same. Mr. Hinson's second wife, Elizabeth Brown (Kinnon) was my late father, Reverend Leroy Kinnon's mother. Mr.and Mrs. Hinson lived for decades on Addison Avenue, Palo Alto, a few houses away from the famous HP Garage. My father was also the Assistant Minister, serving under Reverend Elston, of the Palo Alto University AME Zion Church, during the 1970's. Fran's Market, still standing and open on Litton Avenue was owned by Francis Hinson, Isaac Hinson's son. I used to buy ice cream and model car building magazines from Fran's. Isaac Hinson also owned several homes and other properties in Palo Alto. My family's 117 year (1897-2014 and counting) Palo Alto history predates the incorporation of the City of Palo Alto and the opening of Stanford University. Amazing indeed. "My family's 117 year (1897-2014 and counting) Palo Alto history predates the incorporation of the City of Palo Alto and the opening of Stanford University. Amazing indeed." I think they are planning to re-open a PA history museum, and this story should be there. Like in the video section and more photos. Am wondering if you are related to LeRoyal, Karen, and Jill Kinnon, all of whom I knew in HS at Gunn. "Am wondering if you are related to LeRoyal, Karen, and Jill Kinnon, all of whom I knew in HS at Gunn ?" Yes, they are my brother and sisters. Karen passed away in November, 2012.